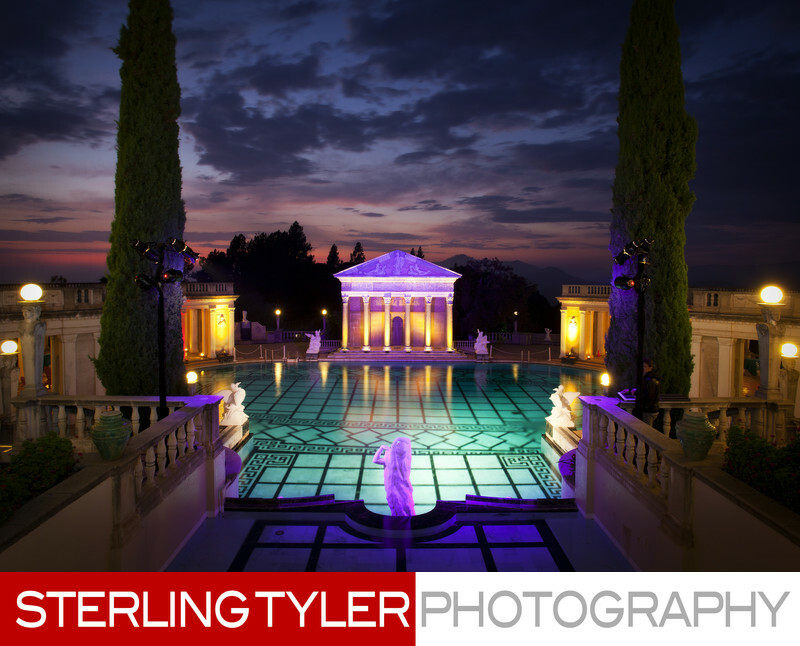 I love the dramatic sky in this image of the Neptune Pool at Hearst Castle! This image was captured just before a VIP reception for Best Buddies International, who support people with intellectual and developmental disabilities. It was an amazing event that included a concert for 2000 guests at the Hearst Ranch, and the VIP reception at the castle for 200. It concluded with a pool party, and guests were invited to SWIM in the Neptune Pool. How cool is that? Back to the image, right? We were incredibly lucky with weather this year, and treated to an amazing sunset. The pool was lit with a set of custom LED lights, installed and controlled by The Right Light LLC from Agoura Hills California. King Dahl Event Design was in charge of additional decor elements, including custom furniture, set design and logistics. Location: Hearst Castle, San Simeon, California, USA.